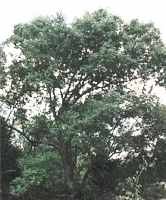 Rounded oak tree with long narrow leaves with serrated edges. Produces medium sized acorns. Hardy to -20F (-28.8C); height 60 ft. Considered the largest of the oaks, this variety forms a massive specimen when mature. Beautiful autumn foliage turns a deep purple red. Rounded growth habit. Give it plenty of room to achieve its full grandeur. Hardy to -30F (-34.4C); height: 80ft. Broad open crown and yellow fall coloring. Thrives in wet conditions alongside water. Hardy to -30F (-34.4C); height: 60ft. Another beautiful type for autumn foliage, turning a deep red in the fall and having a rounded growth habit. This type transplants easily. Prefers a sandy loam. Hardy to -30F (-34.4C); height: 80ft. Massive oak with broad conical crown. Tough tree, withstanding both cold and drought. Excellent shade or forest tree. Hardy to 10F (-17.7C); height: 120ft. Symmetrical oak with a strong trunk and a round open spreading crown. Very tolerant of dry sandy soils. Leaves are green, turning brilliant scarlet in the autumn. Fast growing. Hardy to -30F (-34.3C); height: 80ft. Upright oak with dark green leaves that turn yellow, then red, then purple in the fall. Produces small acorns. Hardy to -30F (-34.4C); height: 75ft. Native US oak with broad round head and deep red fall coloring. Excellent shade or forest tree. Hardy to -30F (-34.4C); height 80 ft. 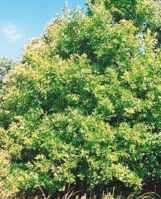 Slow to medium growing oak with a large form. Majestic tree. 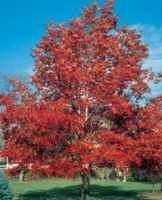 Use as a shade tree, specimen tree or for timber. Hardy to -40F (-40C); height: 80ft. 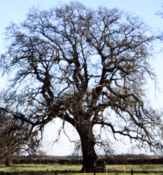 A lover of moist soils, this oak forms an upright tree with a rounded crown. Leaves are lobed and serrated. Hardy to -30F (-34.4C); height 100 ft.
Good shade tree with fine green leaves, requiring moist acidic soil. Yellow to red fall color. Hardy to -30F(-34.4C): height: 100ft. A magnificent tree with a short trunk with deeply ridged grey bark and wide spreading crown. Leaves are smaller than in many other varieties - green turning to red in the fall. Good shade or forest tree. Slow growing, but needs plenty of room to reach its full potential. Hardy to -40F (-40C); height: 140ft. Very strong columnar oak with upright branching. Excellent in the landscape. Tolerates a wide range of soils and conditions. Hardy to -30F (-34.4C); height: 60ft. Dark green foliage turns yellow to red in the fall. More tolerant of acidic soils than many oaks. Hardy to -20F (-28.8C); height: 75ft. A medium sized native US oak with a tall trunk and an irregularly shaped rounded crown. It prefers a fairly dry sandy site, but is very tolerant of almost any condition. A long lived tree (200 years +). Hardy to -40F (-40C); height: 140ft. Extremely adaptable tree with evergreen foliage. Very useful for areas that experience drought or extreme soil types. Hardy to 10F (-17.7C); hight: 100 ft.